Comforts and material goods never mattered to the 83-year-old Fr. Joel. He has never even given a thought to abandoning the hut that he himself had dug below ground. At only a few square meters, it is big enough for the monk to go in there and pray. To build the churches in the villages where he lives, Fr. Joel struggled and ran tirelessly in order to collect donations, and is pleased that his achievement was successful. 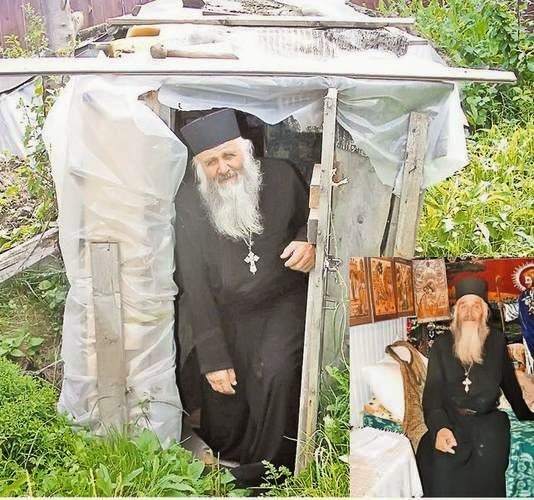 "I dug out the hut, and for two years was supplicating the Panagia to help me find the money to build a church. I finally built not one, but three churches! I don't know how to thank God for all this," he stated. Source: Liber Tatea, "A ridicat trei biserici, dar stă într-o colibă", August 23, 2011. Translated by John Sanidopoulos.